Over the last several years, the frequent topic of conversation has been the drought and our lack of meaningful rainfall. This winter can now put any complaint about that away for a while. 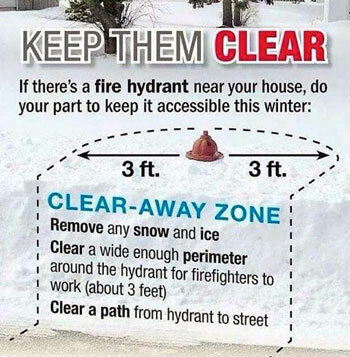 Recommendations for clearing snow from around fire hydrants. El Niño, La Niña, “Houston, I think we might have missed the trajectory on this one.” And the collateral damage from all the visitors, well I won’t even go there. With any snowfall comes a certain amount of inconvenience that we all deal with. Everything from hazardous driving and walking on icy ground, to shoveling a little to get a car out or a path to a door. Usually, these are simple tasks when only a couple of inches of normal Southern California snow comes through. This winter has not been normal. Even those areas of our state that typically get snow in larger amounts every winter have been crushed with storms dumping snow measured in feet, not inches. So while we’re all enjoying this much-needed rain and snow, fire departments that operate in these harsh areas continue to respond to fires. Winter statistically brings more structure fires. These are often caused by the increased use of heating appliances such as fireplaces, wood stoves, furnaces, wall heaters and the ever-popular space heater. Now we all know that fire engines carry water. The typical minimum for most is 500 gallons. Properly applied, and in the early stage of a single room and contents fire, you can knock down and contain a fire with this amount of water. Following last weekend’s storm, snow camouflages an Idyllwild fire hydrant. But, add all the factors involved with this fire, such as a delay in reporting or finding the fire, travel distance, traffic or access, and the engineer driving this unit or the supporting engine will need to always be looking for the closest fire hydrant to supplement and back up the fire attack. So, where is that fire hydrant we drove by all summer on our way to town in our own neighborhood? After last weekend, it’s a good bet it might be under that berm of snow. I don’t know how much effort our local fire agencies have put into clearing or prioritizing hydrants after this kind of storm, and it would not be expected that all of the hundreds of these would get that attention. 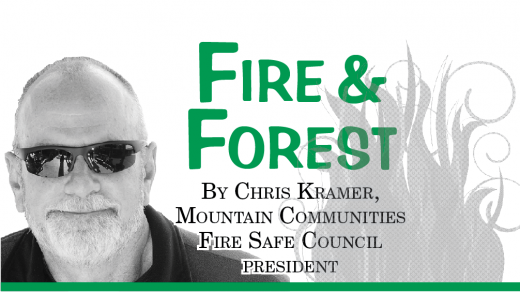 Should a fire happen in your neighborhood, critical time and manpower will be used to locate and dig out a needed hydrant taking away from fire suppression or even a life-rescue task. 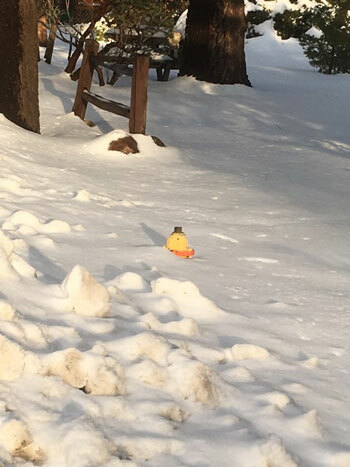 Some High Sierra community residents have informally “adopted a hydrant” in their neighborhoods and taken on the task of clearing snow 3 feet in all directions from the hydrant and assuring street visibility for firefighters. What a great idea. So, think about it for your neighborhood; either now, if you know where it is, or after the next snowfall. We all could take the time and earn a little good “karma” by helping the fire department, your neighbors and maybe even your own home by getting behind this simple idea.